Krazy Garlik: Can You Handle the Smell? After picking up my mother-in-law at the airport this evening, we went to Krazy Garlik for dinner. Krazy Garlik is part of the Bistro group of restaurants located in Greenbelt 5. As the name suggests, a big part of their menu is inundated with garlic. Using the Bistro card, we were able to avail of a 20% discount in the total bill. 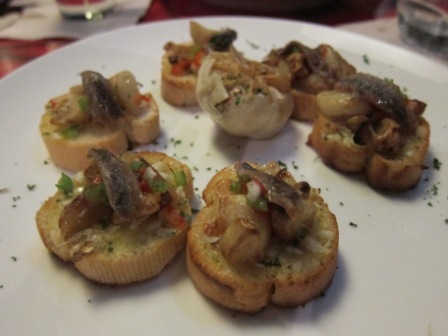 For appetizers, we had their anchovies and garlic on bruschetta (not sure if spelling is correct). Hubby has imitated this successfully before. This appetizer truly embodies the concept of this restaurant. The garlic is roasted and cooked perfectly. For entrees, we had their pork ribs, 40 cloves garlic chicken, seafood curry and hara kiri rice. 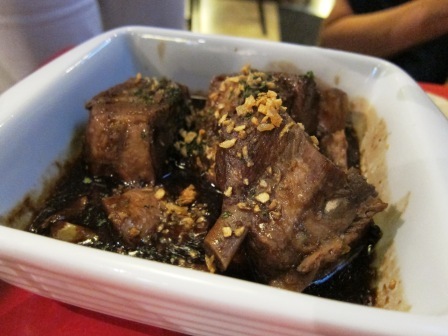 The pork ribs was super tender and cooked adobo style.Just the right amount of sweetness and acidity. For first timers, I would recommend this along with the Crispy Pata. 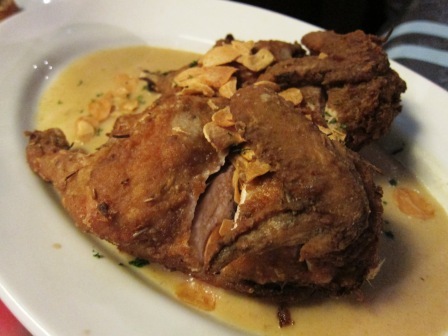 The 40 cloves garlic chicken was big enough for 3 – 4 people. The chicken was tender and juicy. 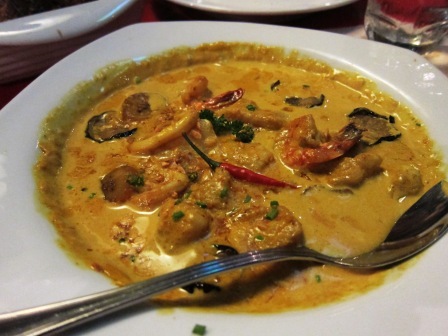 The seafood curry has been a staple every time we come here to eat. Although the serving is quite small, the curry sauce has the right sweetness for my taste. 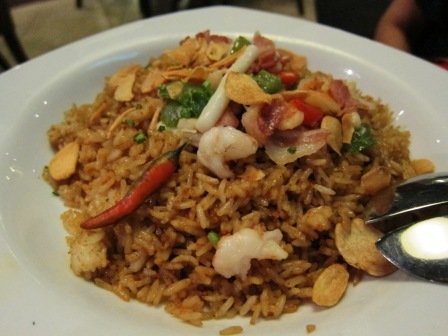 The Hara Kiri Rice is their version of seafood fried rice. This is a bit on the spicy side hence if you can’t take the heat, you can request them to make it less spicy. For the above dishes, we spent a little under PHP2,000 (inclusive of the 20% discount). This restaurant is a bit on the expensive side.